Goldenfeast Nutmeats and Fruit Blend bird food contains only the very best shelled nuts and fruits are found in this delicious blend. For smaller birds you may want to blenderize into smaller pieces. 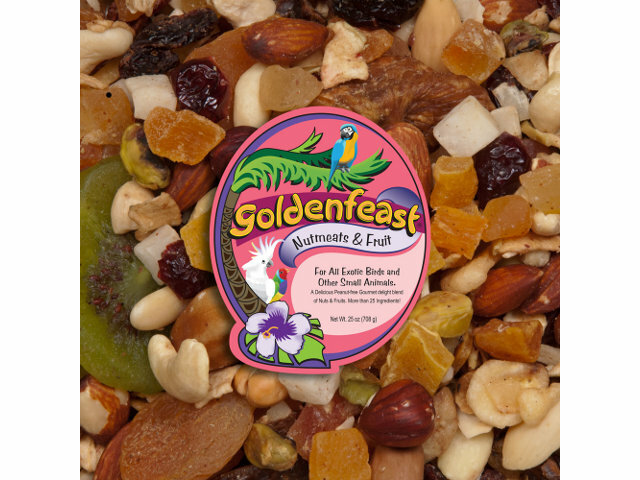 As with all Goldenfeast products, Nutmeats and Fruit Blend contains all human grade ingredients, so you can enjoy these delicious morsels together with your bird. Roasted shelled almonds, shelled unsalted peanuts, diced papaya, banana chips, dehydrated cranberries, cashews, dehydrated apples, dehydrated cherries, diced pineapple, shelled Brazil nuts, diced mangos, flaked coconut, apricots, pepitas, dehydrated blueberries, dehydrated peaches, dehydrated guava, cubed coconut, whole dates, shelled filberts, dried figs, dehydrated strawberries and pistachios.